I know it's hard to think of what to say, but you could make it very simple, tell her she's in your thoughts, and then sign it and add your hometown. Thanks so much! EDITED TO ADD: Heidi at Simon Says Stamp is offering up a $100.00 gift voucher to someone who sends Maddy a card. Please visit the Simon Says Stamp blog for details. This first one uses papers from Authentique's Lovely collection. The bottle caps I chose are flattened chrome caps and here I filled this one with a circle of one of the papers, and then placed it into the center of my die-cut flower. My sentiment is a stamp and die combination by Simon called Expressions for You. I made a really easy card for my 2nd sample today, playing with some new washi: a washi paper from We R Memory Keepers, which I also used to line my bottle cap, and a Queen & Co tape. I added a sentiment from the Simon exclusive Flower Friend, stamped in Hero Arts Red Royal mid-tone ink and a double bow of twine. Heidi has given us another $50.00 gift voucher for the random winner of this challenge. You can use it for anything you'd like at the Simon Says Stamp Superstore! As I was browsing my blogs as I do each morning, I saw that Penny Black is bringing out a new release! 2 of the new stamps are really lovely frames, and that reminded me of a PB stamp that a sweet friend gave to me a few years ago; it's also a frame, from 1997 called Ruffle Frame. So I pulled it out and CASEd the card shown on the blog today, using what I have here at home. Every day this week some of the new stamps will be shown, and some lucky ducky is going to win the full release! Hop on over to the Penny Black blog to get the details!! This set is the Violet one from PTI's Year of Flowers. I used Graphic 45 papers from their Secret Garden collection (it's hard to find purples nowadays! Does anyone have any suggestions for pretty ones?). The background is a Hero Arts lattice cling stamp, as are the pearls. ETA: I'd also like to add this to Moxie Fab World's Mixy-Matchy Style Challenge, since Cath now allows us to use cards made up to a month ahead of her challenges, if they fit the specifications. Materials used: Hero Arts CL338 Be Yourself (large leaf sprig), Green Hills mid-tone ink, CL496 Layered Flowers, Technique Tuesday Simply You by Ali Edwards (one of my FAVE sentiments), Echo Park Bundle of Joy Dots & Stripes paper for flower, BoBunny soft shades double dot for die-cut leaves (Sizzix Sizzlits Branch with Leaves), green dotty button, white twine, my DH's hole punch for the dots on the flowers. I hope you'll visit The Craft's Meow today and leave me a comment there. Thank you! I thought this Hero Arts flower and the matching smaller version of it would work well for her paper-piecing technique. I decided to use the papers from Graphic 45's Secret Garden Patterns & Solids because I could get all these in the same pattern, and the reverse of them was a solid, which worked for the smaller flower. I centered my flower with a button, and added the PTI sentiment from Flower Fusion #12 and a peach Martha Stewart butterfly punch. My background paper is from Memory Box. It takes some time to stamp all those individual "fabrics", but it still beats making a real quilt!! Yes, I see that blue ink smoosh........I should have masked off my sentiment........Lesson learned. Here's a card I made to enter into the PaperTrey Ink's Make it Monday challenge: paper piecing. These tulips are from PTI's Friendship Jar Spring Filler set. I pieced them with papers from Lawn Fawn's Bright Side paper pad, and placed them on a board background from the MME Bramble Rose pad. My sentiment is from Hero Arts, and the gingham ribbon is a gift from my teamie Lisa at Christmas. My card uses the lovely Wplus9 Blanket Stitched Blooms and papers from My Mind's Eye "Notable" paper pad, along with some matching enamel dots. Happy Wednesday! And Happy 93rd birthday to my Dad! Wednesdays mean a new challenge at Simon Says Stamp, and this week our theme is Take a Picture! I must admit that at first I wasn't sure what to do with it, but when I saw this adorable pink camera sticker, I was all in! It is part of a fun sticker sheet by American Crafts Dear Lizzy, in the Neapolitan line. The little heart in the center of the lens is another of the stickers, as is the heart banner at the top right of my card. 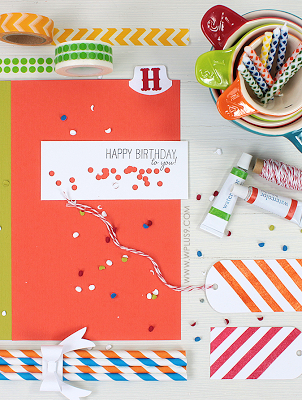 The striped background paper and Smile strip are from one of the 12" papers in the Neapolitan line. 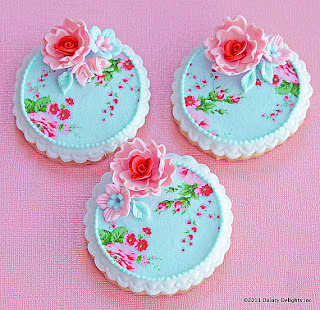 I love the soft pastels and girly motifs! So this card was easy-peasy - I just added my own paper doily and some adhesive pink flower buttons! So, what will you make us this week? I can't wait to see! My teamies and our Guest Designer Annette have got lots of ideas to start your ideas coming! 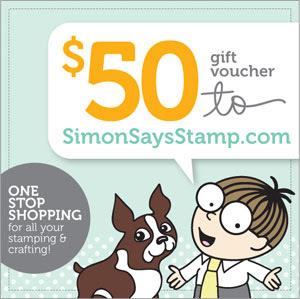 Our generous Heidi is offering up another $50.00 gift voucher for use in the Simon Says Stamp store! Welcome back to our final day of previewing our newest releases at The Craft's Meow! Today is also a blog hop! You should have arrived here from Karen's blog. If you'd like to begin at the start of the hop, just go to The Craft's Meow blog, and there will be a list posted there. Once you get started, you'll be directed from blog to blog. I went the actual chalkboard route on this one and stamped this darling message on black cardstock, heat embossing it with white powder. Then I framed it with a gold cardstock and a design paper from Teresa Collins Carolina Breeze collection, and added a button and some die-cut leaves to one corner of it. On this card, I used these confetti and banner papers from Echo Park's Hello Summer collection, and stamped this one on some pool cardstock. I like how festive it turned out! Now it's time for you to hop on to sweet Lindsay's blog. We're sad to tell you that this will be Lindsay's last official post as a designer for TCM. We wish her the best going forward! Don't forget to let her know she'll be missed, and also leave a comment on each of our blogs to be in the running for a random draw for all of the 5 stamp sets we've debuted this week! You have until 8:00 PM PDT on Thursday, May 23 to comment. Welcome back again today to our 4th day of new releases at The Craft's Meow! Today we're showing you a set called Let's Face It, by Nina. B Designs. This is such a unique set - can't wait for you to see it revealed. I chose this floral paper (MME's Lime Twist) and pulled my colors from it. I was going for a Jackie O. look. Please visit The Craft's Meow blog to see what my team-mates made for you today, and then leave a comment there by 8:00 PM PDT tonight for a chance to win this Let's Face It set . And come on back tomorrow for a blog hop featuring our 5th and last stamp set being released this month! The papers are all from Authentique's romantic collection called Cherish. I stamped just one of the 12 sentiments and one of the 3 flourished flowers in the set on some cream cardstock, then used my Die-Namics doily die to cut out around it. The middle panel is a lovely May Arts silk ribbon and I added some tiny pink pearls under the sentiment. I embossed the frame design on cream cardstock, trimmed it, then added 2 coordinating washi tapes, my sentiments from Side by Side, and these Petaloo flowers. Then the panel was added to a camel card base. Please visit The Craft's Meow blog to see what my team-mates did with this lovely stamp set. Leave a comment at The Craft's Meow blog by 8:00 PM PST tonight for a chance to win this Side by Side set! And I hope to see you back again tomorrow for Day Four of our previews. 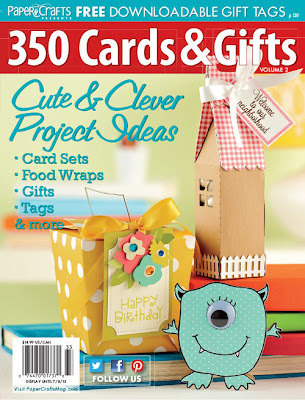 Please visit The Craft's Meow blog to see what my team-mates did with this lovely stamp set. Leave a comment at The Craft's Meow blog by 8:00 PM PST tonight for a chance to win this new Wildflower set! Lisa will be giving away a set to a lucky commenter at The Craft's Meow Blog! And please come back again tomorrow for another preview of another of our 5 new sets! This one uses papers from MME's Moments paper pad, and another of the hymns. Have you heard that we have 3 new designers joining us at The Craft's Meow? Amy Crockett, Angi Barrs, and Jinny Newlin will be giving us their unique spins using TCM stamps! Please be sure to visit their blogs and give them a nice welcome! I had a free day to myself yesterday, so I played with this wonderful Wplus9 Quilt Prints stamp set. Using my Hero Arts mid-tone inks, I first stamped the "stitched" outline in Charcoal, then filled in the "fabrics" with Green Hills, Butter Bar, and Bubble Gum. After trimming my panel to fit my card base, I ran it through a Cuttlebug Houndstooth embossing folder to give it that dimpled look that real quilts have after being washed many times. Then using some rose cardstock and BoBunny Passion Fruit dotted papers, I die-cut 2 each of the 3 sizes of PTI's Beautiful Blooms II flowers, securing them with a little yellow Basic Grey brad. My leaf dies are from Wplus9's Folk Art Florals die set, and the sentiment comes from an old clear set, an Archiver's/Hero Arts exclusive. Love this new quilt set - I hope that Wplus9 continues to offer us more in the same style! The collection is called Sun Kiss, and the colors are spring-like aquas, sunny yellows, and greens. I chose one of the papers as my background and 2 of the 6 flowers included in the package, and added a doily and some buttons. My sentiment is from an Impression Obsession set called In a Garden. While I had that Sun Kiss paper pad open, I chose another paper featuring sunflowers and one of the little tags that are included on one of the pages, and put them together, just adding a ribbon and a die-cut sunflower centered with a button. Dear Heidi has given us another $50.00 gift voucher for the random winner of this challenge. I started with a kraft card base as Maile did, stamping my background Dot Flower Pattern using Latte chalk ink. I used the same ink to stamp the Lenten Roses onto ivory cardstock, and colored the leaves and flowers minimally with Memento markers before fussy-cutting them out. Again following Maile's example, I added a pink ribbon and a sentiment from Find Joy, stamped in Cup o' Joe ink, then popped my flowers above the card base. Once again, thanks for visiting - Happy Mother's Day to those of you in the US! At Moxie Fab World, Cath has challenged us to create a coordinated card set and matching container, and she's kindly allowed us to re-enter anything we've done within the last 4 weeks. So I'm using this card set that I posted on April 23, and decorated a little basket container to hold them. If you'd like the supplies for the cards, please visit my blog post referenced above. My friend Mary Anne gave me this cute basket awhile back, and I can just fit the cards inside (I think Ill put some Easter grass or colorful tissue paper in the very bottom where it's too narrow for the cards to fit). To decorate it, I embossed the cuttlebug Poppy folder on white cardstock, then pounced my distress inks, spritzed with water, dried and then cut out the largest Nesties Labels 20, and attached it to the basket. I made a little banner using a stamp from Simon's Flower Friend set. I stamped, colored, and die-cut another butterfly, and used some silk ribbons and a colorful yarn to wrap around the handle. I'll probably give this to my Mom or sister as a Mother's Day gift. Thanks, Cath, for this great challenge! I can't wait to see what's in the gallery for this challenge! I'm a huge lover of all things Wplus9 - they have wonderful stamps and dies! Trouble is, somehow I don't own many of their products, so I haven't participated in many of their challenges. But when I saw this amazing inspiration photo for the current Cloud9 May Blog Hop, I just had to give it a try! I added some dies from some "other" companies along with a sentiment from a Simon exclusive stamp set. LOVE how the Quilt Prints stamp up, and with all the options for fill-ins in this wonderful set, the sky's the limit with what I'll be doing with it!